Home > 2014 > 10/08 > Time for predictions! With the puck dropping Wednesday night to start the NHL season, everyone is scrambling to get their predictions out there for the world to see. Here at TLN, we’re no different, and it’s time we got in on the fun. Go ahead and scroll down for our Eastern Conference standings predictions, along with a quick defence from each writer on their Leafs ranking. Overall, not looking good for the Leafs, but I think something everyone can agree on is that the East is 1) weak 2) completely wide open from about 5th to 14th place. The Leafs are heading into the season piggy-backing off of one of the best summers they’ve ever had. They haven’t completely given themselves a makeover, but all the small changes they’ve made shows a giant philosophical change that creates hope and rustles the jimmies. That said, I don’t think the system changes are going to do enough to make the Leafs a playoff team with Carlyle at the helm. The assistant coaches will help (especially Horachek), but ultimately the Leafs will fall just short of making the postseason. But I’d love to be proven wrong. *(my name was drawn from a hat to play the role of the optimist.) The Leafs have a roster good enough to be a playoff team in the East (because a lot of these teams aren’t very good), and with some added depth at the bottom of the roster it’s a little less scary when injuries inevitably happen. 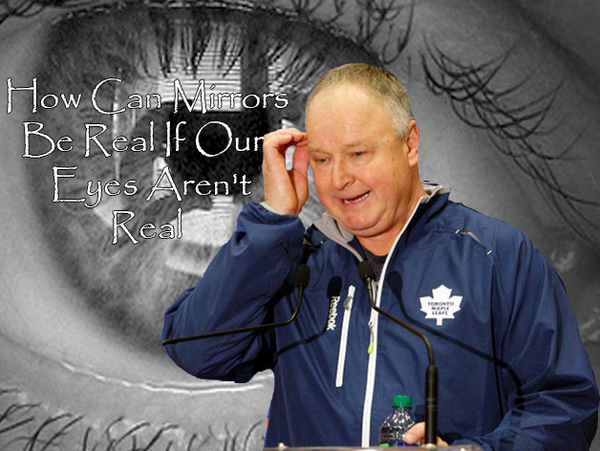 Of course, the Leafs still have Carlyle, and nobody does less with more than Randy Carlyle. His impact is strong enough for a two spot drop, which may ultimately only be a 4-5 point difference between making the playoffs and a typical Toronto spring. If Carlyle is canned by American Thanksgiving I think the Leafs are a playoff team, but if it’s a longer wait than that 10th spot seems like the safest bet. If Carlyle wasn’t the coach I’d probably put the Leafs in the playoffs. They have a talented team. They have the goalie, the top-end forwards and the skill on the backend. The problem is, until Carlyle is no longer the coach, I don’t trust them to utilize all the talent properly. I also don’t think Carlyle will last the whole season, but by the time he’s gone, it’ll be too late. The teams on the cusp – Columbus, Washington, New Jersey – are all better and less volatile than the Leafs. That’s why I see them just missing out. The bottom of the roster finally features players who can actually play hockey. Whether they’ll be properly utilized is an entirely different story. The Leafs have the talent to play with the top dogs of the East, but it’s a matter of getting the most out of a defensively deficient team, something Carlyle hasn’t been able to do in his time here so far. The new assistant coaches could provide a step in the right direction, but I doubt it’s enough to turn a historically bad possession team into one that’s even mediocre. While the Leafs do have a great power play, it’s mitigated by a disastrous penalty kill. That leaves the Leafs biggest strength in net. Can Bernier repeat his spectacular debut as a Leaf? It’s possible. But can goaltending alone get the current state of the team into the playoffs? I wouldn’t count on that. We’ve talked a lot about how the Leafs are a tough team to read because they have their fair share of talent (at least relative to the conference), but coaching has made them a trainwreck. At the very least, they should be contending for the last playoff spot. The 5th to 14th spots are up in the air, and I’m going to go ahead and put the Leafs at the top of that pile. I truly believe Carlyle will have little control of this team and they’ll take a step forward in the possession game. On top of that, they’re capable of ripping off some unbelievable goaltending and shooting the lights out, so I think if they get things straightened out, they make a big jump. I predict the pedagogical shift towards a priori analytics will ultimately be a failed experiment with the 82 game season showing that advanced stats cannot find synthesis with reality. Bloggers will deny this experience sacrifice another coach to secure their unwavering blind faith in pure reason. What? A priori knowledge means independent of all experience and may be, but is not properly a description of timing. A priori analytics is a nonsense term because the very term analytics assumes some data, some experience is being analyzed – it is dependent on this experience and can’t possibly be a priori. Hell, the third definition of a priori is “nonanalytic”. You nerds read everything literally, just throwing darts. I’m honestly quite surprised by the fact that Carlyle is still employed. I’m not trying to throw fuel on the fire. It just seems like every person in the blogging and sports writing worlds (not named Darren Dreger) seems to agree that Carlyle is holding the team back instead of making it better. It just seems weird. Maybe the brass has something planned? Who knows.. I was intrigued by M.L.B. playoff teams wearing sweatshirts with the caption. ALWAYS OCTOBER. For the sad sack leafs another year with all the window dressing of a new president, a newer version of the powerless Ken Dryden, who hasn’t gotten the keys to executive washroom. Yep Shanahan couldn’t fire old boy net work guys Nonis, Carlyle, Morrison, Penny, Watt and Senior, senior, senior advisor Cliff Fletcher. The non playoff bound leafs will continue to wear their sweat shirts NEVER MAY. But wait, wait with their 9th to 14th draft pick they will trade under the advice of senior, senior , senior advisor Cliff Fletcher who finished 4 games over 500 in his long tenure with the leafs but was considered a genius, will suggest the leafs give up 2 draft picks to move up to number 5 to select the latest version of Luke Schenn. Isn’t it grand to be a leafs fan. My concern with these predictions is the over-determination of Carlyle as the culprit. While I agree that there’s a lot of incoherence behind the bench, and this will drag the team down, let’s not assume a change in head coach will solve all problems. The defense is still suspect. 1. The team is better this year than last and some positive moves were made over the summer. 2. Some teams in the middle-of-the-pack, DET, NJ, WSH, did not improve as much as the Leafs. MTL inched downward. 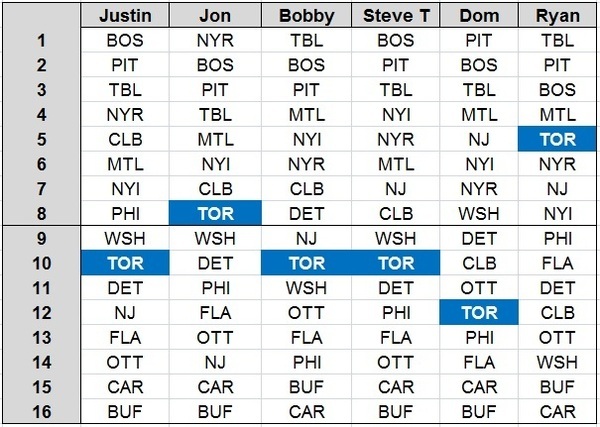 It’s a war in the middle between TOR, MTL, PHI, NYI, maybe DET for 3 spots. I predict TOR, MTL make it and the rest is a crap shoot as they separate by just a couple of points (so, one or two shoot-outs’ difference). and Pollak is a beast with some speed and should be an upgrade on the 3rd pairing as well Percy will get better as he gains experience. Komorov should improve the PK and should make the Leafs harder to play against and Clarkson has to have a better season . The Leafs have more depth that should fix the problems they had overplaying their top players. And Carlyle will be under a microscope with Spott and Horachek I bet reporting to Shanahan to prevent him from making too many old school mistakes. They have kept their word that jobs where open to the young players and Kozun may have a great year. All in all you cant predict injuries and there maybe some unexpected problems -but all teams suffer from these things. but I believe we have the same chance of finishing second as we do finishing out of the playoffs. Before the slide last year the leafs were challenging for 2nd and I think this we will finish 2nd in the division. From analytics point of view I think these predictions are silly. You guys should be predicting who ends up first overall in Corsi as that is the most repeatable aspect of the game. Predicting who finishes first this season is like predicting how many days it will rain in December and doesn’t provide much insight into the talent and skill of the team. This standings prediction is the kind of content I can get on Sportsnet with Cox. Sorry to be the bad guy here but you guys can do better.